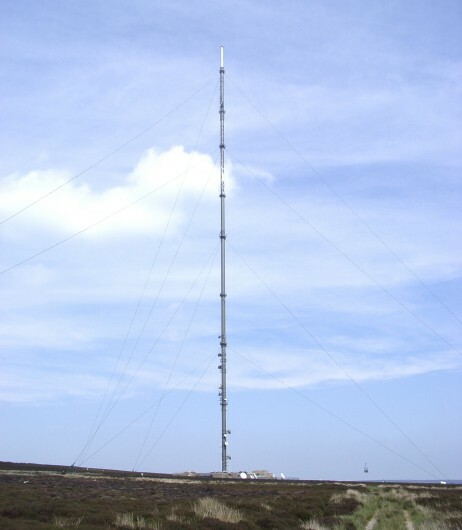 Bilsdale television transmitter from the moor below it. Note the repainting in progress (it certainly seemed to need it !) and the “Bosun`s Chair” being used to ascend the mast, see below. Bilsdale TV transmitter from the B1257, which runs from Helmsley to Stokesley. Incidentally if you are ever in this area of the beautiful North Yorks Moors National Park it`s worth visiting Rievaulx Terrace and the Abbey below it. “Bosun`s Chair” being used to access Bilsdale whilst it was being repainted in June 2007. Above the right is the winch (and its anchors ! ) to hoist the “chair” up as required. Below (left) is the same system being used on Redruth in 2005 and on the right the type of paint used to coat the structures. 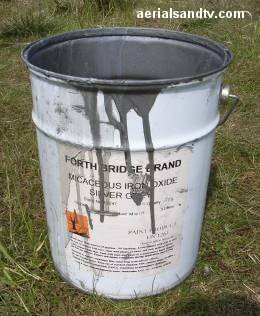 The masts are galvanised with a 25 year warranty against rust, after that time they`re repainted every 10 years with etching primer then Micaceous Iron Oxide on top of that. And we all love the Forth Rail Bridge don`t we, I know I do ! Note the channels out of the original A group of the transmitter, the PSBs are within the A group though. 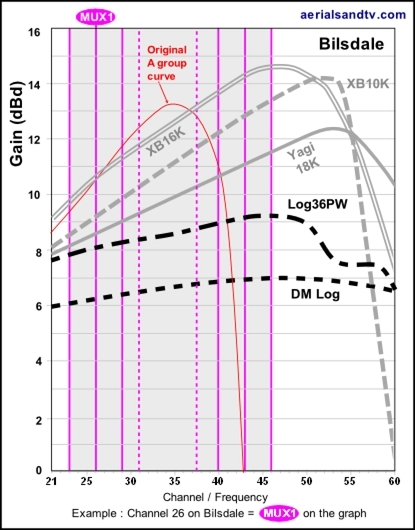 Also see other relevant K group curves. 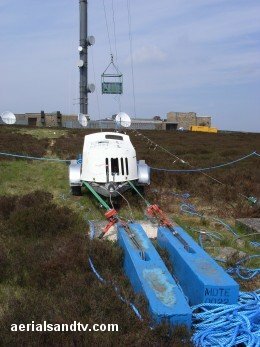 Bilsdale television transmitter (TX) is a "guyed mast" structure (309m in height) and is identical to Waltham and Mendip, though it was built by JL Eves (now Babcock) whilst the other two were constructed by BICC (now Balfour Beatty). The mast is a tubular structure to the top and has in internal lift, though this is out of use following the accident at Belmont. 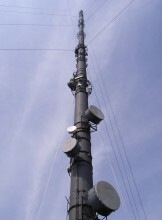 The transmitter was originally owned by the BBC before being sold off to Crown Castle (Castle Transmission International - CTI) then to National Grid Wireless and finally to Arquiva (sic). Opened in 1969, the transmitter is about 15 miles SSE of Middlesborough, it can be seen from the A1 on a clear day. As one travels North it`s on the right. A slightly better view can be had from the railway line (between York and Darlington) as it is a little closer, perhaps 12 miles away. This particular stretch of the East Coast Main Line originally opened in 1841 as the Great North of England Railway. The A19 from the A1 up to Teeside passes closer still. 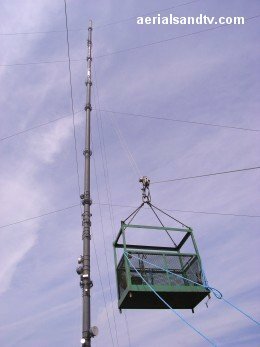 Due to the fact the 309m mast (see How High is High ? ) is built on a 376m mountain (the setting is quite spectacular) the overall aerial height/altitude is 685m (2260ft) and unsurprisingly this is one of the highest in Great Britain. The latter fact obviously helps its transmission range, but like all transmissions they are subject to the “line of sight” rule, even with a “high gain aerial” ! 700MHz clearance is due at Bilsdale in Q4 2019, it will be staying a K group (CHs 21 to 46) excl M7 & M8. Bilsdale`s population coverage is around a million. Many of those in York, Darlington, Stockton, Middlesborough, Hartlepool, Sunderland and Harrogate use Bilsdale`s transmissions, though it can also be received at sites on high ground in Sheffield, that`s 70 odd miles away ! There is one “Local” channel allocated to Bilsdale, CH24, mainly for a local Middelsborough TV station. In addition there are two low power HD MUXES CHs 31 and 37. All of these are within the K group. For Bilsdale we recommend the DM log for strong signal areas, the Log36 for medium signal areas, and the Yagi18K or XB10K for poor signal areas, the latter aerial being particularly well suited to loft mounting. The XB16K is for those with the most marginal signals. 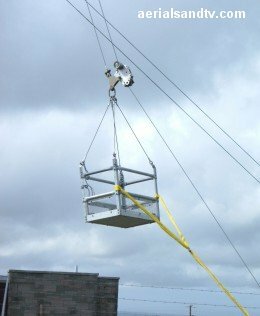 The dimensions and test performance of the aerials are on the relevant tables. The table below includes the same information for Pontop Pike, Chatton, Fenham, Emley Moor, Wharfdale, Idle, Keighley, Sheffield, Belmont and Oliver`s Mount. All these transmitters are receivable within Bilsdale`s coverage area and this information can be very useful for identifying alternative transmitters. The channel allocation guides can be very useful in the diagnosis of co-channel interference problems and can also be invaluable if you are trying to find a spare channel for a modulated output (e.g. for a Sky box or CCTV system) to be added to your TV setup/distribution system without suffering from co-channel. Note how most of the channels from all the transmitters neatly “dovetail” with each other, though there are potential problems with Fenham, Chatton, Idle, Keighley and Sheffield. Also check Bilsdale`s fifteen smaller relays. 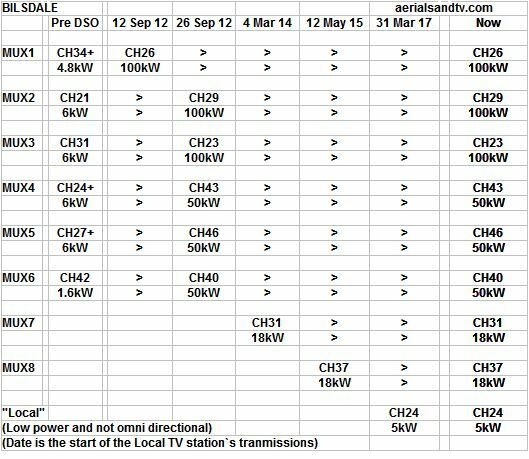 Bilsdale puts out 100kW of digital power which makes it the 13th most powerful transmitter, see the accompanying table. Note the huge increase in power at the 2012 digital switchover. Bilsdale is horizontally polarised was originally an A group for its analogue output but only 3 (the PSBs) of the 6 main digital MUXES can still be received with a group A aerial. MUXES 4 to 6 are out of band so most people would have to change their aerial (to a K group or wideband). The transmitter has fifteen smaller relays (or repeaters) to improve coverage in poor reception areas within its coverage area. 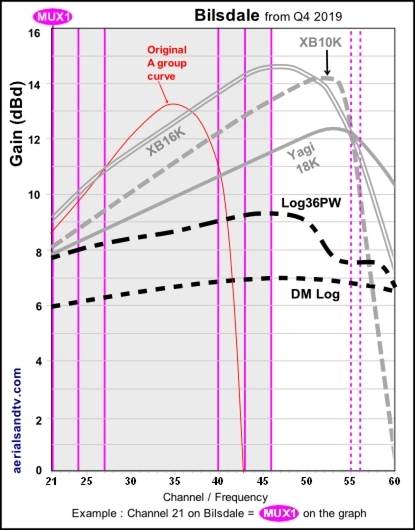 Bilsdale TX graph post 700MHz clearance in Q4 2019, not much different….